Thanks to our members and external people from the club supporting our activities, we have had the advantage in recent years to significantly increase the number of devices to exhibit. This will allow us to rotate them in our showcase. Currently we are in the process of inventorying, preparing and photographing them. We also establish a small technical documentation for each device that will be used to describe it in the showcase. Our historical transmitter / receiver collection of the Swiss military aviation, largely made up of our honorary member Kurt Ernst, retired instructor of the Swiss Air Force. 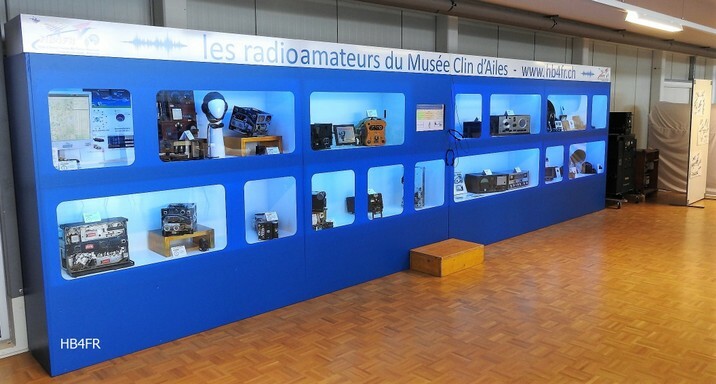 Our collection of historic civilian devices, including a unique "Hallicrafters" collection, made up largely by our honorary member Max de Henseler, HB9RS (Silent Key †). The jewel of the collection is the transmitter Hallicrafters BC-610, which was part of the SE-402 radio station operated by the Swiss army. 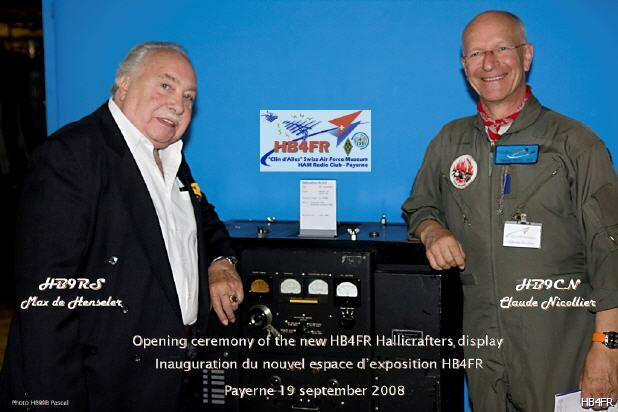 Right: Astronaut Claude Nicollier, HB9CN. Claude is an honorary member of our club and supports us especially in our actions with students and students. [To know more about astronaut Claude Nicollier]. 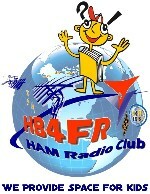 The radio between the two is a Hallicrafters BC-610 transmitter: It is a transmitter that was built on the basis of the amateur radio transmitter Hallicrafters HT-4 and the AT-3 antenna tuner. The radio station, known as SCR-499 / A, consisted of the BC-610 transmitter and the BC-342 and BC-312 "Signal Corps" receivers. It was sold by the Americans after the war as a surplus to the Swiss army. It was first engaged under the name of SM46, then under the name of SE-402.